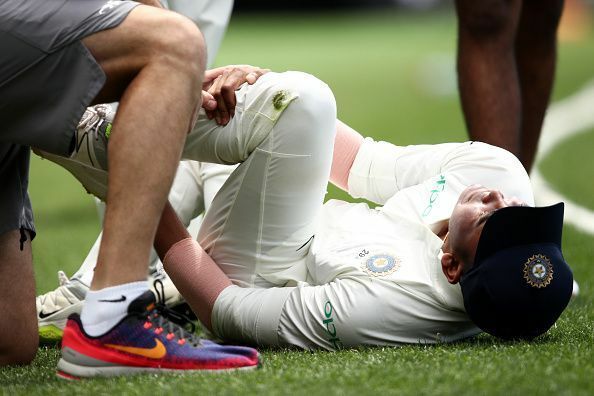 The injury to the in-form opener Prithvi Shaw has dealt a severe blow to the Indian team after he rolled his ankle in a practice game today. Shaw got carried away off the field by the Indian team Physio and headed straight to the hospital for further investigations. The ill-fated incident happened when Shaw endeavored a catch at the deep mid-wicket boundary, off Max Bryant’s lofted shot. The Indian youngster leaped high and took the catch but, to maintain his balance, he rolled his left ankle on landing ending in an upsetting injury. India would now avail the services of Murali Vijay and K L Rahul to open the innings for India in the Adelaide test. The injury comes in the most unseemly time for Shaw who had hit a debut century against the West Indies in Rajkot to end the series with 237 runs from his three innings. Following his knocks, he earned the praise from legendary players too. With regarding to the injury, India may look out for Shikhar Dhawan or seasoned Ranji performer, Mayank Agarwal to replace the U-19 winning captain. Rohit Sharma Scores… India Roars..! !